My son and I started fishing at daylight above Desert Aire. The wind blew hard early and it rained a little on us and it was hard to fish. We had very few bites and we tried every bait combination we had. Bait of choice seemed to be Rollmop Herring. Late morning my son finally got one to take the bait and he set the hook. Only words I remember hearing was , Oh Oh, this one may be to big to keep. We threw the anchor and chased the fish for over half an hour. It took all of the line off his reel at several points and the reel had some problems so we were sure the fish would be lost. When we finally got the sturgeon to the boat it was too big to fit in our net so we struggled to get it in. When we measured the fish it was 63 inches to the fork and 69 inches to the end of the tail. Trying to get a fish that size in a cooler is quite a task, we had nothing large enough to keep it cool. We did have several black garbage bags so we went to the store and bought six bags of ice and packed it best we could on the floor of the boat and headed for home. The sturgeon weighted 65 pounds and played both of us out. View other reports from dlantis. Not sure I am reading this right but if I am, make sure you check the regs before even bringing the fish into the boat. Nice fish and thank you for the report. Perfectly legal fish as they just opened that stretch of river for sturgeon for retention on fish between 38" and 72" nose to fork. Nice Fish. I was over checking out Wanapum and Priest Rapids for any reports on Sturgeon. Is this the first time you weer out and have you heard if anyone else has been doing any good. ? I was thinking of taking three or four days to try it out but I haven't a clue where to go there. I'm used to fishing the lower Columbia and its tributaries for Sturg, but since they pretty much shut it down for keepers I haven't been out. How deep were you fishing? Did you launch at desert aire? 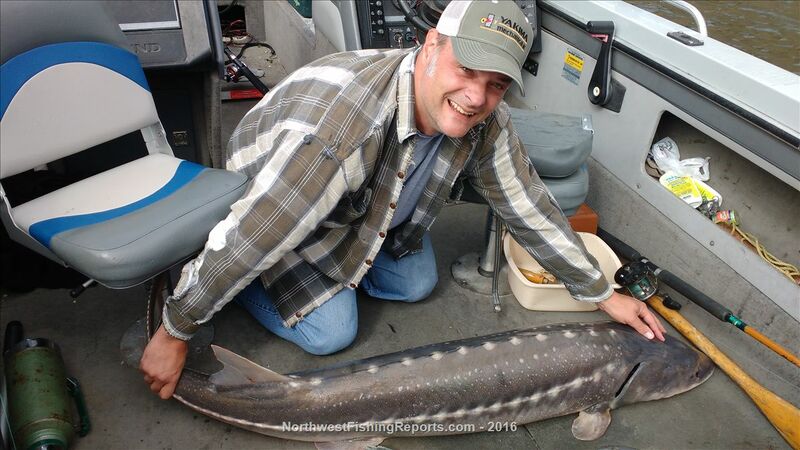 Hello DaPooh, We have been fishing for the sturgeon 5 trips since it opened and we have caught only two sturgeon. 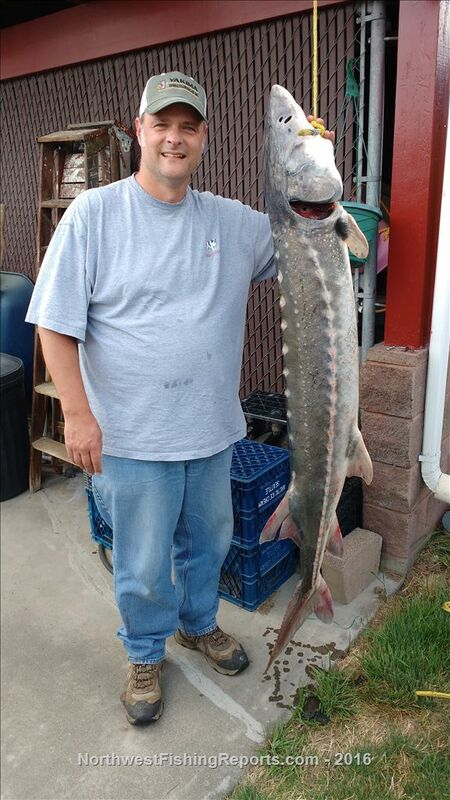 The first one was 53 inches fork length and weighed 40 pounds. The one on Sunday was a big one. We have seen 4 other fish caught in those 5 trips. We are fishing in 40 to 50 feet of water and we launched from Buckshot, just above Desert Aire. The wind has played a major role in our success, when it is capping you can't tell if you are getting a bite or not. Several trips we did not see a bite. Reason for action: Hatchery-origin white sturgeon residing in Wanapum and Priest Rapids reservoirs since the early 2000's are abundant and have grown to a harvestable size. Removal of these hatchery-origin fish is consistent with ongoing actions to rebuild depressed populations of wild-origin White Sturgeon in Wanapum and Priest Rapids reservoirs. All closed water areas in and around Wanapum, Priest Rapids, and Rock Island dams are still in effect. Check the current sport fishing rules pamphlet for complete details (http: //wdfw.wa.gov/fishing/regulations/). Thanks for showing how important it is to keep up with emergency rules. It can benefit you but can also get you in trouble if not monitored prior to fishing. Thanks much for the info. Hope your luck gets better. Understand what the wind can do to a Sturg. Bite. Hard to feel em. Still thinking about the trip. Sure do like those Sturg,, mighty tasty. I'll shoot you a response on this site if I head down. Good Fishin! Has anyone you know fished the Wanapum Resevoir? That is also open per the emergency rule change?